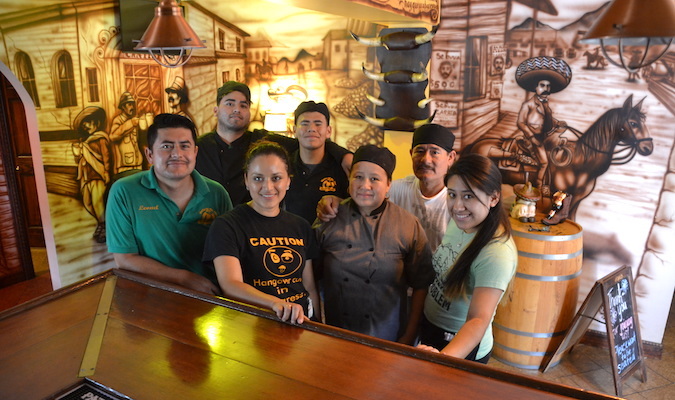 Photos by Tom Rivers: Some of the Rosario family members who work at Mariachi De Oro Mexican Grill include, front row, from left: Leonel, Dolores, Isabel and Gladys. Back row: Sergio, Kevin and Donato. MEDINA – Six years ago the Rosario family opened Mariachi De Oro Mexican Grill on Maple Ridge Road, following nearly a year of renovations. Six brothers – Francisco, Sergio, Martin, Pablo, Donato and Leonel – plus their sister Elba transformed the site. They rebuilt and expanded the kitchen and gave the dining area and grounds a new look. The restaurant showcases their Mexican culture. The family members had all worked for years at local farms. They wanted to try their own business. 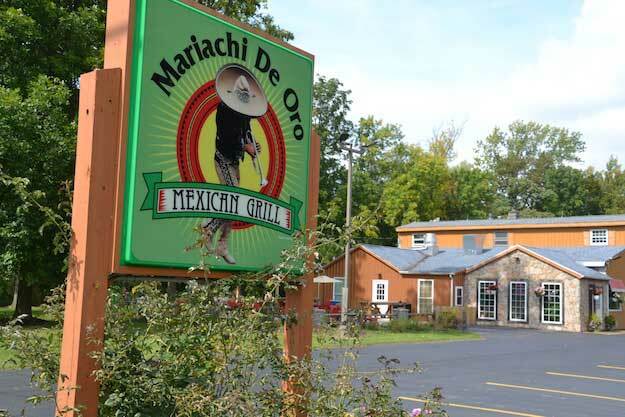 Mariachi has been a stunning success, Orleans County Chamber of Commerce officials said in naming Mariachi its “Business of the Year.” The Rosarios and other Chamber award winners will be celebrated Friday during an awards banquet at the White Birth in Lyndonville. The business has grown since it opened on Sept. 9, 2011, putting on an addition for a bar and bathrooms, an outdoor patio, and continued additions to the menu. Mariachi is waiting for its outdoor liquor license to cater to customers on the patio. Mariachi hired artists for Mexican-themed murals inside the restaurant, and has a mariachi band perform monthly. Mariachi De Oro Mexican Grill is located at 11417 Maple Ridge Rd. The restaurant draws many out-of-county visitors to Medina for the authentic Mexican cuisine. Mariachi has been featured in very positive reviews from The Buffalo News and Buffalo Spree. “Everything is fresh, that is our secret,” said Leonel Rosario, co-owner of the restaurant and the head cook and manager. Mariachi has Mexican staples – burritos, tacos, fajitas – and much more, from seafood, to steak and pork dinners. They make their own fresh tortillas. Many of the spices used in the kitchen are imported from Mexico. Leonel uses many of his family’s recipes from the state of Oaxaca. 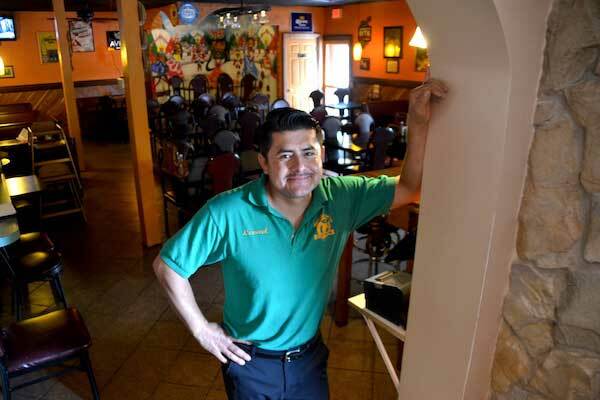 “When people ask me about Mariachi, I tell them we are a Mexican restaurant, but we are more than a Mexican restaurant,” said Leonel, 35, the youngest of the brothers. Some of the family continues to work in local agriculture. The family also runs Monte Alban, a Mexican grocery and clothing store that opened about a decade ago on Route 31 in Medina. There is also a taco stand behind Monte Alban’s. Leonel is a steady presence at mariachi. He is often joined by his wife Dolores and their children, Leonel Jr., 16; and Galilea, 15. He was interviewed on Tuesday after the lunch rush. Question: Are you surprised by the Chamber award? Answer: Yes. When I found out I was really happy and excited. In the first year that we opened and I was back there cooking, sometimes we didn’t have any customers for a couple hours. You feel like, ‘What’s the point being back there?’ And then you keep pushing more, and doing more things and you start seeing more customers. You get better at things. When you see these kind of achievements happen, it makes you feel really proud and thankful. It gives you more energy to do things that you’ve already been thinking about. For me it was like a payoff for 80-hour weeks. I’m used to being inside the kitchen. Leonel Rosario is pictured at Mariachi De Oro with the main dining room behind him. Question: Eighty hours a week for six years? Answer: Yes. You get time off here and there. But like any other business owner you can never leave your place. Question: You and your family are really quite a success story. I am impressed with the Rosarios. You guys seem to get along well, too. Answer: For us it hasn’t been uphill all of the time. We have always run businesses together. We have respect for the older siblings. That’s a main reason why we’re able to work so well together. And also because we lived together as brothers and sisters with no parents. 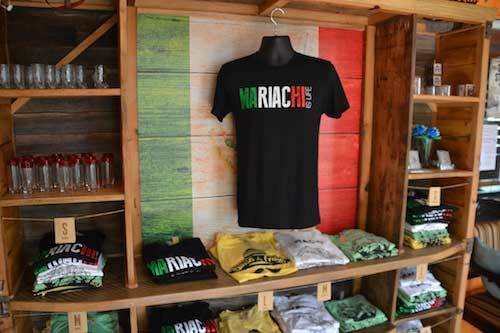 There is plenty of Mariachi merchandise available at the restaurant. Question: You mentioned you were working on an outdoor liquor license. How much more can you do here? Answer: I want to have Mariachi del Oro be a place where you can have a real authentic Mexican meal plus have an awesome experience with what’s happening. I want us to have more than food. I want to bring my culture and our traditions into the place and share it with everybody. We’re bringing in a mariachi band and let people come in and learn about other cultures. The mariachi band comes every month. I want to do more music. I want to do more events just so people can have fun. Question: I noticed you do many public events, with dancing and food, despite a busy schedule. Answer: That was always one of things that helped me to get out of my self zone and achieve more because I studied my dancing and the sharing of the Oaxaca and Mexican culture. Anytime they ask, I always go for it. It’s one of the things I also enjoy a lot. Dancing will always be one of my biggest hobbies. Leonel and Dolores Rosario perform a Mexican folk dance in March 2016 at the “The Colonnade.” That site is the former Masonic Temple now used a cultural center by the World Life Institute. Question: It’s pretty high energy dancing. You got to be in good shape to do that. Answer: Yes. Before I could dance like it was nothing, but now that I’m 35, I’m started to feel it a little more. Me and my wife we have always loved dancing. Question: Why has Medina worked for you, especially at this site? Answer: I think Medina is the type of community where everybody is starting to think and bring so many more ideas that it is helping the town to bring people in from miles away. They are doing a lot of events, which I think is really nice for all of the business owners in the community. The MBA (Medina Business Association) comes up with all of these ideas. With us, we wanted to join them and share with them what we can offer to help bring people into Medina. 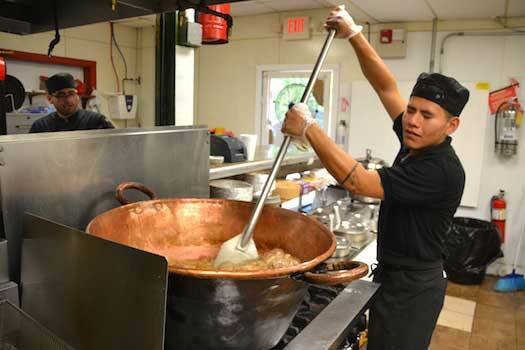 Kevin Rosario cooks a big pot of pork on Tuesday for the dinner crowd at Mariachi’s. His cousin Sergio is in back working as the grill cook. Question: It seems like this location by creek has also worked out well for you? Answer: Yes. We found this place. We saw it and we liked it. We went for it. I think it’s a beautiful spot. We get people from the city. Question: The name Mariachi De Oro, what does that mean? Answer: The Golden Mariachi. That’s what it means. When we were thinking about what to name it, some us love mariachi music. I love mariachi music. We wanted to always bring a mariachi band to play. So that’s why it’s Mariachi De Oro. 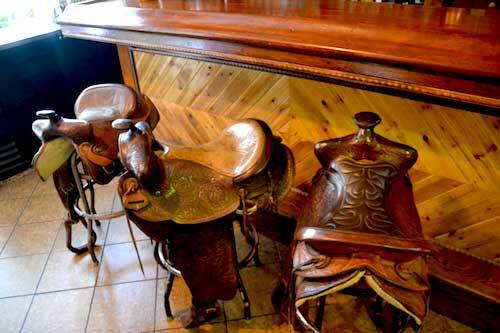 The bar stools have saddles to sit on at Mariachi Del Oro.